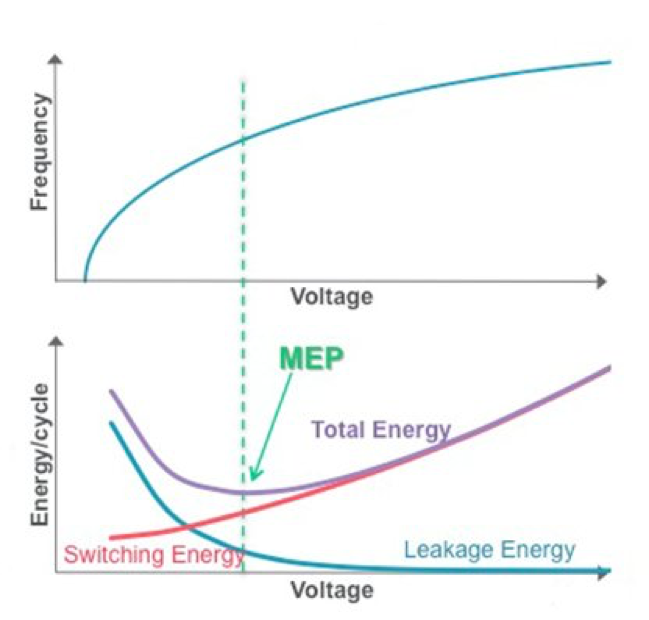 Process variation plus timing are adding to low-power challenges at the most advanced nodes. Complex issues stemming from near-threshold computing, where the operating voltage and threshold voltage are very close together, are becoming more common at each new node. In fact, there are reports that the top five mobile chip companies, all with chips at 10/7nm, have had performance failures traced back to process variation and timing issues. Once a rather esoteric design technique, near-threshold computing has become a given at the most advanced nodes. In order to extend battery life and functionality—two competing goals—chipmakers have been forced to use every possible technique and tool available to them. But at 10/7nm and beyond, process variation and complex timing are creating new issues related to near-threshold approaches. “When you look at the distribution of process and voltage variation at voltages near-threshold, you see a non-Gaussian distribution. Existing models (such as AOCV and LVF) do not represent non-Gaussian behavior. However, the industry is aware of this, and Arm is helping drive new modeling parameters. Designers must be aware of what LVF models include, whether moments are modeled, and must take this into account when using LVF as part of their implementation. Using LVF without moments on low voltage designs can have significant impact on design yield and additional margin should be considered. Regardless of the supply voltage planned for a given design, the importance of the power grid cannot be overstated! Different FinFET processes have a varying interdependence between cell architecture and optimal power grid options. Some of the power grid challenges are related to strict and/or complex design rules. However, power grid design is a key design element to limit the impacts of the wide range of wire resistance across temperatures at small geometries and the significant increase in wire and VIA resistance from one FinFET node to the next smaller FinFET node,” she said. Near-threshold approaches also aren’t free. They require a significant amount of analysis. Timing is not immune from the impact of near-threshold voltage. In fact, near-threshold voltage means there is a point at which the circuit starts to transition from a one to a zero or zero to a one, for example. And in full-rail voltage applications, the input of these circuits has time to reach the rail voltage, which is well above the threshold voltage, according to Ruben Molina, director of product marketing for StarRC Extraction and In-design Rail Analysis at Synopsys. All of this has a pretty dramatic effect on timing, especially for circuits that haven’t really reached the state where the circuit has transitioned from a zero to a one. As such, it’s very sensitive in that area to things like noise. This is where advanced waveform propagation techniques come into place. They are used to model the shape of the waveform because they can’t be treated like digital circuits anymore. They are a lot more analog-ish than they used to be. Based on the magnitude of the impact of near-threshold voltage, it is now imperative that design teams deal with this from the very start of the design. With normalized Gaussian distributions, most of the data points fall in the middle, with some outliers around the edges. That determines how much margin to include, with the final number based both on the designer’s experience along with the data from models and tools. These variations are not operating in the center of the lane, either. They are actually operating on the edge of the lane, whether from a power perspective, a performance perspective, or both. This puts a big emphasis on extremely accurate—think Monte Carlo accuracy– high-performance process variation prediction on the order of 100X faster than SPICE prediction, said ANSYS’ Gupta. This kind of technology creates transistor models with a level of accuracy within 2% of Monte Carlo SPICE, so that tens of thousands of critical paths can be run and true silicon behavior can be analyzed to understand what the true margins are. While there is a significant amount of certification on the foundry side, it really falls on the EDA vendors to try to help the designers to make sure that they’re capturing these effects properly, he concluded.